With their kids draining their funds, six rich businessmen and women decide if they are to remain wealthy, they must do away with their brattish children. Fortunately for them, a solution arises in the form of horned Heinrich and his boss who reside in the monster dimension who promise that they’ll dispatch their children by using them as a training exercise for seven of their would-be monsters who’ve yet to prove themselves worthy of the title ‘monster’. Agreeing to this, the parents sit back and watch the terror unfold on their offspring. 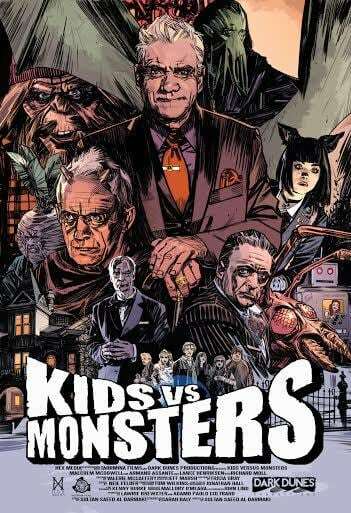 Family horror fantasy flick KIDS VS MONSTERS takes the kind of kids you’ve seen win the Golden Tickets from Charlie and the Chocolate Factory battle for their lives against monsters hired by their parents to exterminate them instead of Wonka and his fabulous candy creations. Ranging from a bat-like butler to a brawling beetroot-man, there’s plenty of monsters up for the challenge to prove their good name worthy of becoming a fully-fledged monster for the boss (Malcolm McDowell). There’s a fun energy to this movie that I really dig however the film feels as though it lacks depth and substance to really invest in the characters. These kids, albeit most are spoilt and brattish, should be kids you can invest in, be it for good or bad. Whilst we get to know them a bit, they don’t feel as important to the plot as they should do and therefore when they come across the monsters, it’s very hard to feel for them in one way or another. Even the monsters, who look fantastic I must add, feel underused and don’t become much more than a novelty appearance that are unveiled for a brief moment before having the veil firmly thrown back over the top of them. I wanted it to be Charlie and the Chocolate Factory sprogs meets the fear and thrills of Goosebumps but the outcome fails to hit that mark. As each monster is revealed for the rich parents, McDowell, with the help of a horned Lance Henriksen, gives a background on the monster’s history which is usually a sob story in some shape or form. This is done using animation and contrasts the live action quite beautifully. By the end of the tales, you end up siding with the monsters, rooting for them to kill the kids off one by one. Despite this film having horror tones, there’s nothing particularly scary here that will frighten as the monsters play more for laughs than anything else. There’s some good ideas in KIDS VS MONSTERS, maybe not quite original but fun nonetheless. However, as a whole the film feels unfinished or as though it only just scratches the surface and is no where near meaty enough to sink your teeth into.